Unless otherwise indicated below, to learn more about or sign up for the following projects, please contact Jacqueline Laverdure (jacqueline.laverdure@noaa.gov). Analyze past and current year's Olympic Coastal Clean-up data for trends. 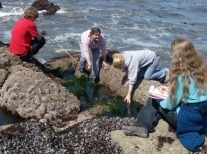 Create graphs and possibly interactive maps to present on the Coastal Clean-up promotional materials and Coast Savers website (www.coastsavers.org). Use GPS to map the current contours of the river mouths of coastal rivers including the Hoh, Quileute, Elwha and others. Create a GIS map of this data.